This adventure, designed for new players, pits the Queen's Knights against large arachnids and their voracious master. The Spider Burrow is an adventure designed for 1st level characters set in the fantasy realm of Elustra. Notes for scaling this adventure can be found at the conclusion of this document. The Queen’s Knights have received a request for help from Tomas Brightmeadow, a human living on the outskirts of Kurth. Kurth is a village to the south of Twombly that is famous for its tailors. Tomas’s letter explains that his alpaca herd has been ravaged by the biggest spiders he’s ever seen. He fears that if the Queen’s Knights don’t help him soon, the spiders may eat all of his animals and decide to prey on his family. By the time the Queen’s Knights arrive to help the Brightmeadow family, it is too late. Tomas and his wife, Elise, have been taken away by the spiders. Their young daughter, Wren, who was hidden by her mother when the arachnids attacked their farmhouse, was able to avoid being captured. Though in good health, Wren is young and frightened for her parents. What the players don’t know is that the spiders are controlled by a lesser ettercap that makes its lair in a small tunnel complex beneath an old, dead tree. The ettercap, being a juvenile member of its species, needs more and more prey in order to grow. Because of its ravenous nature, the beast sends out its servants—a brood of tunnel spiders—to bring back as much food as they can. To succeed in this adventure, the Queen’s Knights must locate the entrance to the ettercap’s lair, locate Tomas and Elise Brightmeadow, and rescue them before the lesser ettercap can eat them for supper. Alternately, if this is not the girls’ first adventure, the name of their order and Matron Knight should already be known. Word of their deeds has spread throughout Elustra, and they are well on their way to becoming some of Queen Sunblade’s most cherished knights. The players’ characters are called together one afternoon by their matron knight at the Queen’s palace in the city of Twombly. Their matron knight informs them that the Queen's Knights have received a message from a herder living outside of Kurth, a village south of Twombly known for its fine cloth and tailoring. The matron knight briefs the players by reading Tomas Brightmeadow’s letter. As of late, my alpacas have been vanishing. The last of them was taken away last night despite my best efforts to protect it. Spiders—the biggest spiders I’ve ever seen—came out of the woods south of my home, wrapped the last alpaca up, and dragged it away. I was too frightened to face the spiders, and all I could do was watch in horror. I am now in fear for my family. My wife, Elise, and my daughter, Wren, are all that I have. With no alpacas to hunt, I worry the spiders might turn their appetites on us. Please come as swiftly as you can! The matter is straightforward, but the players may have questions for their matron knight. Answer every question they ask, but remember that little is known of the situation outside of Tomas’s letter. If asked about Tomas Brightmeadow, their matron knight tells them that he is famous for the fine alpaca hair he provides to Kurth’s tailors. When the players are ready leave, they are provided with horses and given a map that shows the way to Tomas Brightmeadow’s farmhouse. Their matron knight encourages them to hurry, for there’s no telling how long the Brightmeadow family will be safe. The day is nearly over and a storm is brewing. Dark clouds are gathering overhead, threatening rain. Distant thunder roars from the north, in the direction of the Frostbite Mountains. As you ride towards the city’s south gate, you encounter several citizens who are hurrying home before the rain starts. Many of them greet you with a smile as you pass by. The rain starts a short time after the players leave the city. Fat drops of rain slowly begin to pelt the knights and their horses, but soon the volume of water increases substantially. Outside of the rain, the journey south from Twombly should be as eventful (or uneventful) as you want it to be. As the rain begins to fall, the players pass a small group of travelers setting up camp on the side of the road. The travelers are attempting to raise tents and start a cooking fire, but the wind and rain are making it especially difficult. Noticing the knights, one of the travelers waves to them and asks them for help. Should they decide to pitch in, the players can aid the travelers in raising their tents. Starting the cooking fire is the most difficult task, but any player who succeeds on a DC 15 Survival check is cheered as they manage to stoke a warming blaze despite the weather. The road to Kurth crosses the Verdant Run, a shallow river that runs from east to west. Due to the rain, the river has swollen, and is much deeper than normal. Though travelers can normally ford the river with little difficulty, the players must risk being swept downriver by the heavy current when they cross. To cross the river, each player must succeed on a DC 12 Animal Handling check in order to guide their horses. Should a player fail, have them make a DC 10 Dexterity saving throw to remain atop their horse. If this saving throw is also failed, they are washed from their saddle and must succeed on a DC 12 Athletics check to swim to safety. The other players may attempt to help their comrades and should be allowed to do so. Canny players may also decide to tie a rope to one another to form a chain before fording the Verdant Run. It’s also more than likely that your players will come up with ideas that aren’t covered here. The most important part is to let them try and to praise them for particularly good ideas. As they travel through the heavy rain, the players encounter a Halfling named Samuel Loomspinner from Kurth. When encountered, Samuel is covered in mud and standing along the side of the road. If approached, he explains that his pony was frightened by a lighting strike and threw him from the saddle. The pony—a brown mare he refers to as Jangles—ran off, and Samuel is very upset at losing her. Players can choose to aid Samuel in finding his pony. To track the beast despite the downpour requires a DC 15 Survival check. Players can also attempt a DC 15 Perception check, and any who succeed can hear the sounds of a scared pony to the north of the road. Jangles is frightened, so once she’s found a DC 12 Animal Handling check will calm her down. If the players aren’t able to find Jangles, Samuel will thank them for trying and continue on his way. The rain continues, and it is nearly dark when the players arrive at Tomas Brightmeadow’s farmhouse. As they approach, they descend into a shallow valley populated by the occasional tree. The southern edge of the valley is thickly wooded by a small copse of trees, while the land to the north, east, and west appears to be clear land fit for grazing. You cross the open meadow and approach Brightmeadow’s farmhouse. The front door hangs open, and deep gouges, as if from a single claw or horn, mar the splintered wood. Inside, the house is a shambles. Puddles of water have been tracked in from outside. The fire in the hearth is lit, but beginning to die. What’s more, traces of what appears to be some kind of webbing can be seen hanging from doorframes and stuck to furniture. The house is small and free of monsters, featuring a combined living area/hearth/kitchen, as well as two bedrooms and a privy. There is also a cellar which is stocked with dry manure (for use as fuel) and parcels of alpaca hair. As they search the house, one or more of the players hears what sounds like a sob coming from a chest at the foot of a bed. Opening the chest, which isn’t locked, they find a little girl no more than eight years old. This is Wren Brightmeadow, the only child of Tomas and Elise. Wren, if appropriately comforted and/or cajoled, relates the details of the attack to the players. While her father attempted to hold off the spiders at the door with an axe, her mother hid her in the chest at the end of the bed. Despite Tomas Brightmeadow’s best efforts, both he and his wife were taken by the spiders while Wren was left alone. Though Wren doesn’t know where her parents are, and she didn’t actually see the spiders attack, she knows that something was trying to get in and that her parents seemed frightened. She also knows that when the last of the alpacas disappeared, her dad went looking and found a strange burrow on the south side of the meadow. Though the rain eases up, it doesn’t stop completely. The burrow isn’t terribly hard to find, and by now the players should know where to look for it. Anyone looking to find it must succeed on a DC 13 Perception check with advantage (in other words, they roll two dice and keep the better result). The burrow is situated at the base of a large, dead oak tree. The tree is lifeless and split down the middle, the result of a lightning strike that must have happened fifteen or twenty years ago. The hole is about three feet wide, two feet high, and looks to descend into the ground. Traces of webbing similar to what was found in the farmhouse can be seen around and inside the hole. hole abruptly descends deeper into the earth. When climbing down, the players can use roots as handholds. Climbing up or down the hole without incident requires a DC 10 Athletics check. The bottom levels out into a 30 feet by 25 feet chamber which is connected to a tunnel that leads off into the darkness. You find yourself in a cramped chamber that smells of earth and organic decay. The walls are covered in thin sheets of dirty white fabric, and strands of the stuff hang from the ceiling in thick clumps. The ceiling here is high enough for you to walk upright, but the ground is moist and squishes under your feet. A dark tunnel leads off to the north. The “fabric” is actually webbing, and the players can learn this if they take a closer look. Once half the players have climbed down into the chamber, two tunnel spiders rush in from a side passage. They hiss and attack the nearest character(s). Should the players dispatch the spiders quickly, feel free to send two or three more spiders in as the remaining knights enter the burrow from above. Scurrying towards you are two large spiders, about the size of dogs. Covered in brown spines, their eight legs move almost too fast to be seen, their prominent fangs drip with venom, and their eight black eyes fix upon you hungrily. Spd 40 ft., climb 40 ft.
Spider climb. The spider can climb difficult surfaces, including upside down and on ceilings, without needing to make an ability check. Bite. Melee Weapon Attack: +2 to hit, reach 5 ft., one creature. Hit: 1d4 piercing damage, and the target must make a DC 10 Constitution saving throw, taking 1d6 poison damage on a failed save, or half as much on a successful one. If the poison damage reduces the target to 0 hit points, the target is stable but poisoned for 1 hour, even after regaining hit points, and is paralyzed while poisoned in this way. The north tunnel is fifty feet long and leads into a much larger cavern. This is the spiders’ brood chamber, where the tunnel spiders spend most of their time spinning webs, devouring prey, laying eggs, and resting. You leave the long tunnel and enter into a large cavern. The walls, ceiling, and floor are completely covered in spider webbing, and several lumps wrapped in silk hang from the ceiling or are stuck to the walls and floor. The smell here is foul and rotten. Across the cavern you can make out another tunnel leading into darkness. The players may want to investigate the silk-wrapped lumps, of which there are eight. Most of them are filled with the remains of the alpaca the spiders captured, while a few of the others contain forest animals (such as rabbits, squirrels, and woodchucks) the spiders managed to catch. It doesn’t take long to learn than none of the lumps contains Tomas or Elise Brightmeadow. As the players explore this chamber and investigate the silk-wrapped lumps, they are attacked by a group of tunnel spiders that emerges quietly from hidden silk nests within the chamber walls. There should be at least one tunnel spider for every player, and they use the exact same statistics as the spiders in the Entryway. If the spiders’ nests are investigated once the combat ends, the players find that they contain purse-sized silk sacks filled with tunnel spider eggs. Though harmless, the eggs are liable to hatch eventually. Forward-thinking players may decide to destroy the eggs, while others might come up with a creative way to put them to use. The next tunnel is much longer, and it weaves back and forth as it descends deeper into the earth. It eventually opens up into a cavern much larger than the others the players have seen. The tunnel gives way to a vaulted cavern, its ceiling so high above your heads that it is barely visible in the dim light of your torches. Like the rest of the chambers you’ve been through, this one’s walls are covered in thick webs. Several motionless lumps, all wrapped in silk, are bound securely to the walls. At the far end of the chamber, however, you see two more silk-wrapped lumps… but these ones appear to be moving! The two silk lumps at the end of the chamber contain Tomas and Elise Brightmeadow. Though sick from the spider poison that paralyzed them, both of Wren’s parents should be fine if they can be freed from their webbing and tended to by a healer. Hiding in a silk cocoon on the ceiling is a lesser ettercap. Anyone examining the chamber must succeed on a DC 19 Perception check to notice the creature. If no one notices the beast, it waits until everyone is in the room then shoots a web at the largest character in the group. The ettercap then drops to the floor and attempts to finish everyone off. A horrifying humanoid creature drops from the ceiling, landing deftly upon the silk-covered ground. Though shaped like a man—at least somewhat—the beast has the eyes and fangs of a spider. Spd 30 ft., climb 30 ft.
Spider climb. The lesser ettercap can climb difficult surfaces, including upside down and on ceilings, without needing to make an ability check. Web sense. While in contact with a web, the lesser ettercap knows the exact location of any other creature in contact with the same web. Web walker. The lesser ettercap ignores movement restrictions caused by webbing. Multiattack. 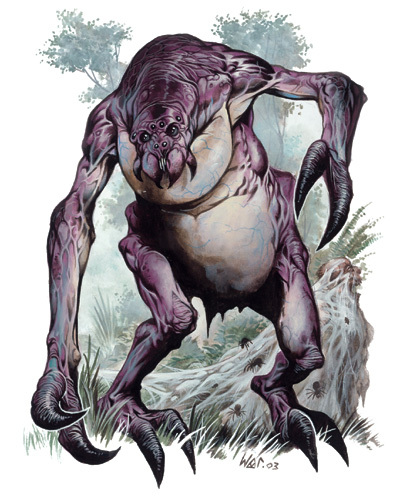 The lesser ettercap makes two attacks: one with its bite, and one with its claws. Bite. Melee Weapon Attack: +3 to hit, reach 5 ft., one creature. Hit: 1d4+1 piercing damage plus 1d4 poison damage. The target must succeed on a DC 10 Constitution saving throw or be poisoned for 1 minute. The creature can repeat the saving throw at the end of each of its turns, ending the effect on itself on a success. Claws. Melee Weapon Attack: +3 to hit, reach 5 ft., one target. Hit: 1d6+1 slashing damage. Web (Recharge 5-6). Ranged Weapon Attack: +3 to hit, range 30/60 ft., one Large or smaller creature. Hit: The creature is restrained by webbing. As an action, the restrained creature can make a DC 10 Strength check, escaping from the webbing on a success. The effect ends if the webbing is destroyed. The webbing has AC 10, 5 hit points, resistance to bludgeoning damage, and immunity to poison and psychic damage. Assuming the players defeat the lesser ettercap and rescue Tomas and Elise Brightmeadow, they are thanked profusely by both of them. Though feeling rather ill from the spider venom, the two are anxious to get home and make sure their daughter is okay. Though Tomas has little in the way of coin to reward the players with, he offers them a dry place to sleep until the storm has passed. Wren is especially impressed with the players and decides that she would like to become one of the Queen’s Knights when she’s old enough. From this point onward, she sends letters to the players every couple of weeks. If the players make an attempt to keep in touch with Wren, they have earned a friend for life. They may even try to arrange for her (and her parents) to visit the Queen’s palace! Should the players wish to search the ettercap’s lair for treasure, they are able to recover a few items of interest in addition to some coinage. Most of the silk-wrapped lumps in the ettercap’s lair contain alpacas, including the one that was stolen the day Tomas wrote his letter to the Queen’s Knights. 110 gold pieces, 2 Bloodstones (25 gp each), 1 Carnelian (50 gp), 1 Star Rose Quartz (25 gp), and 1 Sardonyx (50 gp), a fine cloth hunter’s cap trimmed with ermine (25 gp), a carved wooden mask (25 gp), and a soft leather pouch lined with red silk (25 gp). In addition to the treasure, have the players each attempt a DC 15 Nature check. Each character who succeeds realizes that the spider silk in the burrow can be cleaned and spun into silk thread. If properly harvested, it would be worth a fair amount to Tomas Brightmeadow and his family, perhaps allowing them to buy a new herd of alpacas. 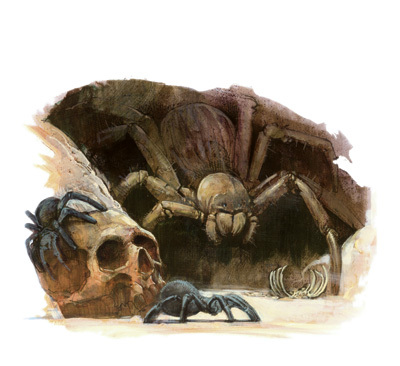 Players gain 200 experience points for defeating the lesser ettercap, and they gain an addition 25 experience points for every tunnel spider they were able to kill. The total of this experience is divided evenly between the players. In addition, each player receives 100 experience points for successfully completing the adventure. If any of the characters help Tomas and his family harvest the silk in the spider burrow so they can recoup their losses, award them each an addition 50 experience points. Last but not least, if any of the players made an effort to utilize the Queen’s Law (Girl Scout Law) in any way, give them an additional 50 experience points. Should your players be 2nd or 3rd level, you can increase the difficulty associated with this adventure by increasing the number of monsters in each encounter, and/or substituting a normal ettercap (MM 131) for the lesser ettercap detailed here, and giant wolf spiders (MM 330) for the tunnel spiders.